I worship Ina. Plain and simple. I’ve yet to make a recipe of hers that hasn’t turned out fantastic…and this one is no different. Except that I didn’t technically make it…my mom did while visiting a few weekends ago. Whilst I was in the middle of seasoning chicken and making cornbread, my mom whipped up these herbed new potatoes that I had chosen to accompany dinner from Ina’s Barefoot in Paris book. I’ve had my eye on this recipes since February and knew it would be a great addition to a casual Saturday night meal of herbed-rubbed chicken (herbes de provence, Kosher salt and pepper), grilled asparagus (toss with a little olive oil, Kosher salt and pepper then grill until slightly charred), and Ina’s cornbread that, while not the optimal starchy side for this meal, still needed to be made for Barefoot Bloggers. These potatoes were fan-freaking-tastic!!! They were buttery, delicious and the because the herbs were tossed in at the end, the earthy flavor didn’t cook out of them. Perfect. Just perfect. What’s nice about how they were cooked is that you’re not a slave to the stove while they cook – you just pop in from time to time to shake the pot – simple. We’re making these again tonight after Kyle has been asking for them since we first had them 2 weeks ago. Thanks Mom for doing such a great job with this recipe!! Melt the butter in a Dutch oven or large heavy-bottomed pot. Add the whole potatoes, salt, and pepper and toss well. Cover the pot tightly and cook over low heat for 20 to 30 35 minutes, until the potatoes are just tender when tested with a small knife. 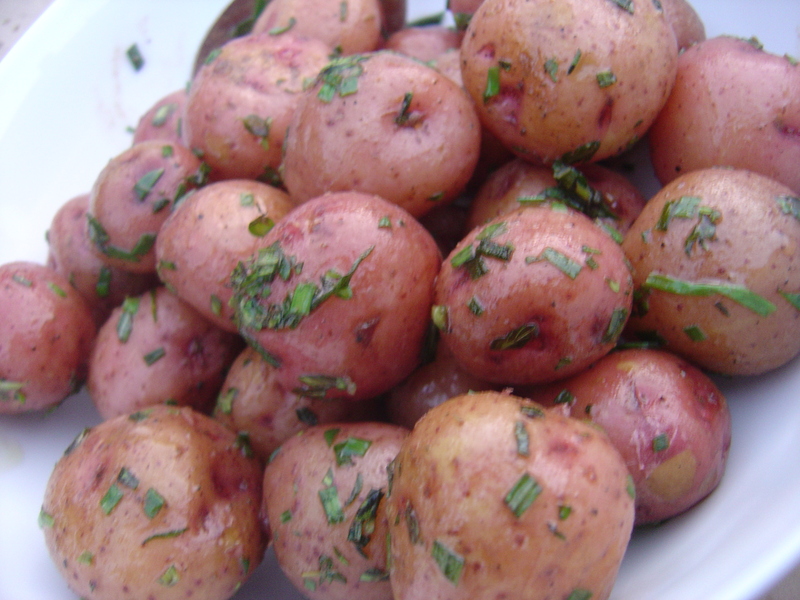 From time to time, shake the pot without removing the lid to prevent the bottom potatoes from burning. Turn off the heat and allow the potatoes to steam for another 5 minutes. Don’t overcook! Toss with the herbs, and serve hot. What I like about this recipe is that it’s simple and there aren’t any fancy ingredients involved. Ina really knows how to keep simple preparations tasty! Those look great! 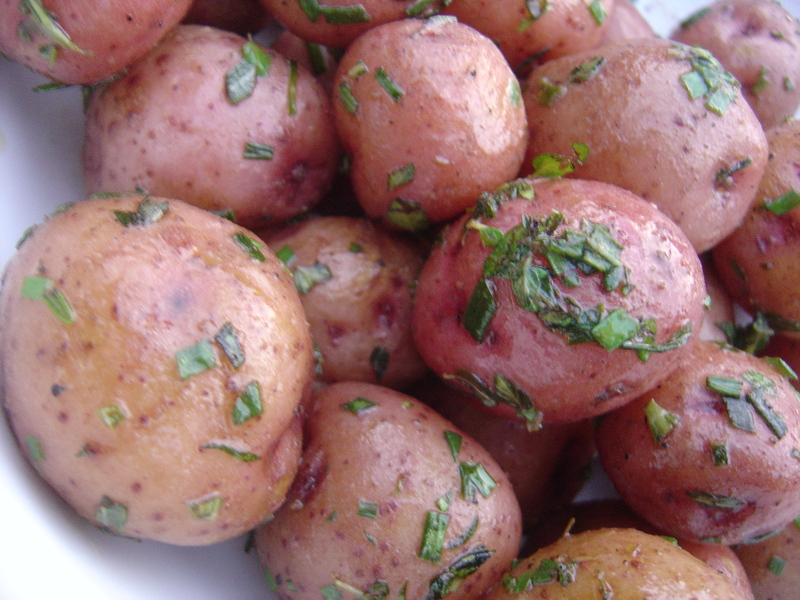 What a simple and delicious way to have potatoes! It’s always those simple classics that keep winning rave results. Yum! I just got the Barefoot Contessa Paris cookbook and can’t wait to make more recipes from it. The lemon chicken with croutons from that book is a fabulous dish.